A turbojet (top image) is an early jet design with all the intake air going through the engine core. Turbojets were noisy and not very efficient. Turbofans (middle image) have replaced turbojets. They come in two flavours - the high bypass turbofan and low bypass engine. The high bypass turbofan is typically seen under the wings of airliners. This type of jet engine is quieter and more efficient, and are great for subsonic airliners like the type you go on holiday in. The advantage of the high bypass engine is that instead of generating all its thrust by accelerating a small amount of air by a large amount, it gets the same momentum change by accelerating a large body of air by a small amount, as only 10% of the intake flow goes through the engine core. 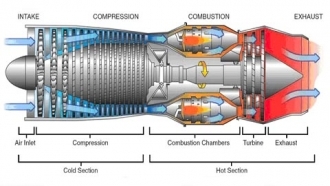 The second type of turbofan is the low bypass engine, where a significant portion of the intake air (around half) goes through the engine core.The bypass air is used to dilute the hot exhaust, reducing noise, but also provides an oxygen-rich mixture that additional fuel can be added to to provide extra thrust with reheat (also known as an afterburner). This type of engine can work at a much greater range of Mach numbers and altitudes, and is typically found in combat aircraft. 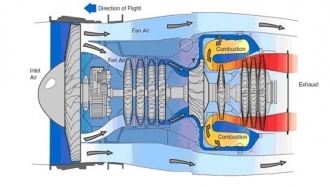 In a turboprop (bottom image), a jet engine is used to drive a propeller through a reduction gearbox driven off either the compressor or a power turbine. 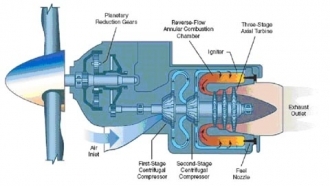 In a turboshaft, like the turboprop, power is taken from a gearbox driven by a power turbine. These are typically found on helicopters, and are also used for industrial and marine applications. Work has been continuing apace at the BLOODHOUND Technical Centre over the last month, where the main focus for the Team has been preparing the lower chassis and fuel tanks for a jet fuel systems test in mid-December. We have also been working on the upper chassis - and there's another busy month ahead. The Rolls-Royce EJ200 jet engine was designed with one purpose, to sit in a Eurofighter Typhoon fighter plane, it was not designed to be used in a jet car. The jet needs to think it is sitting in a Typhoon and recieving the inputs it would expect from the aircraft. Rolls-Royce PLC today announced support for The BLOODHOUND Project. A Rolls-Royce EJ200 jet engine will be used in conjunction with a custom designed hybrid rocket to propel the car to over 1,000 mph (1,600 kmh or Mach 1.4). Rolls-Royce will also provide financial and technical support for the project.